Governments, health insurers and branch organizations in the Netherlands, China, Russia or elsewhere who want to develop or introduce new policy. AMEHR is a network organization. The organization itself is small and flexible. Its network of partners in the Netherlands is extensive. It consists of specialists in the fields of rehabilitation medicine, physiotherapy and occupational therapy, speech therapy, psychology, social work and rehabilitation techniques. Software suppliers can provide tailor-made solutions. Universities are available for education and training. Architects deliver an adequate interior and exterior design of the building. 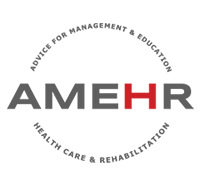 As a result, AMEHR is able to offer a complete package for rehabilitation and elderly care. AMEHR has excellent relationships with Dutch ministries, embassies, consulates and business support offices. Over the years, AMEHR’s network is extended to China and Russia. However, other countries are also within the reach of AMEHR. Hans van Dijk is the founder of AMEHR. He graduated as Master in Political Science at Radboud University in Nijmegen. For 12 years, he was CEO of Rijndam Revalidatie, one of the largest and most innovative rehabilitation centres in The Netherlands. Rijndam is affiliated with Erasmus University Medical Centre. As CEO, he had an important contribution to the growth and development of Rijndam as well as the positioning of rehabilitation within the Dutch health sector. Before he entered the field of rehabilitation, he was a director of a well-known academy for nurses and caregivers. He was involved in the Dutch national project to reform the system of education and training of nurses and caregivers. Apart from his work for AMEHR, Hans van Dijk is the chairman of Stichting Wetenschap Balans, a foundation for advice, research and training to improve the quality of health care for frail elderly. Project management for a consortium of rehabilitation centers in the Netherlands, working on e-rehabilitation. Feasibility study to establish a Chinese-Dutch chain of rehabilitation clinics in China. A three years program to improve the quality of rehabilitation in Tatarstan Republic in the Russian Federation. Advice on guidelines for rehabilitation departments in large and medium-sized hospitals on behalf of the Ministry of Health Care of the People’s Republic of China. Advice on guidelines for rehabilitation centers on behalf of China Disabled Persons Federation. Advice on the establishment of public and private rehabilitation centers in Guangzhou, Zhuhai, Dongguan, Urumqi, Beijing, Shanghai, Tianjin, Chengdu, Shijiazhuang, Fuzhou, Dalian, Shaoxing, Lanzhou, Xi’an, Wuxi. Advice on rehabilitation policy and service system in Shanghai, Baoshan District. Advice on geriatric rehabilitation for the Beijing Municipal Health Commission and various Health Commissions at district level. Advice on Geriatric Rehabilitation for Beijing Geriatric Hospital and the Association of Geriatric Hospitals in China. Consultancy and support to Enraf-Nonius, MotekForcelink, VitalHealth Software, ChooseYourShoes a.o. in finding market and partners in China. Project management development and implementation of the electronic patient file for rehabilitation (R-EPD) for twenty rehabilitation centers, in consultation with the Dutch Association of Rehabilitation Centers, VIR eCare Solutions and VitalHealth Software. Advice on the design of rehabilitation facilities in Romania, Ethiopia, Kenya and Brazil.